One thing I always believe is you don't have to buy a how-to book to learn how to apply makeup. In our (in this case) blessed age of technology, there are too many YouTube tutorials and beauty blogs and magazine articles out there dishing out advice to those unfamiliar in this territory. My venture into painting faces began from watching YouTube tutorials, then beauty blogs, then examining editorials, which I still do. Now that I'm much more at ease at makeup counters, I either ask the artists at hand for tips or observe the techniques they use on me and emulate it when I wield the brush on myself. I thought I might start sharing some of these nuggets of wisdom, whether borrowed from makeup artists or acquired through "eureka" moments of my own. This first tip is "taken" from Dustin. I noticed him doing it when he was making me up to look like a doll. Prior to the makeover, I had already drawn in my eyebrows using Shu Uemura's retractable eyebrow liner (for those new to the site, I've written a fairly comprehensive eyebrow shading tutorial that I'm shamelessly proud of) but the downside to using that formula is my brows can look a little harsh if not combed through correctly after. I suppose it was one of those days when I met him, because he took the flat Le Métier de Beauté eye shadow brush and dipped it lightly into a dark brown shade, then ran the brush through my brows to blend it out. I thought my brows looked fine before, but this step made me realize how important evenness of shading is to a natural-looking brow. You don't need that specific brush to do the blending. However, I would recommend using a flat, tapered brush that isn't stiff - think brushes like Chanel #2 and not those of the MAC #217/#239 variety - so that the area covered by the brush wouldn't exceed the thickness of your brows, or that the brush wouldn't move the pigment. 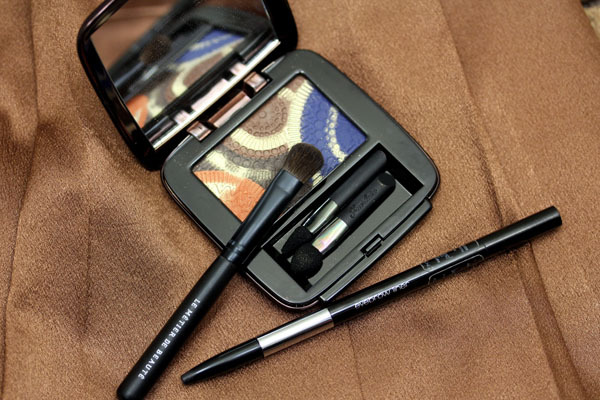 This Bobbi Brown eyebrow brush dipped shadow is the best for a natural brow.